← Salmon Cakes – The easiest recipe I’ve posted yet! In one of my last posts I talked about all the stuff I’d been doing with leftover turkey, then, I posted a recipe for pork. Surprise! I got a few emails asking for the turkey recipes I had mentioned. Since I didn’t have pictures of those I thought I would use a little more of that turkey last night. Even after making this one, would you believe I still have more turkey in the freezer? Wow, I do love making good use of those leftovers! 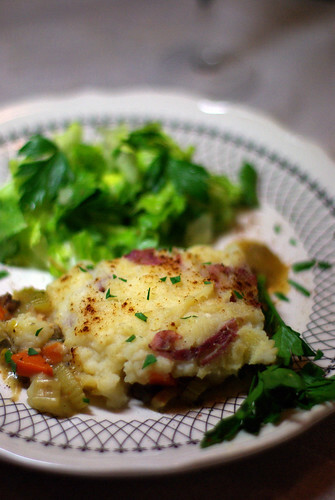 This is sort of a fusion recipe; a pot pie filling with a shepherd’s pie topping. All of the ingredients are fresh and honestly, with the exception of a couple of recipes my daughters will never let me quit cooking, I doubt I could ever go back to making casseroles with frozen veggies and canned soups! When you take that first bite of good fresh food the wholesomeness is immediately apparent…the richness of the leeks and the mushrooms, the depth of flavor in the homemade broth. I can’t recommend enough cooking with fresh food. The payoff in enjoyment (not to mention compliments) is almost as nice as the health benefits! In this recipe I used my own homemade turkey stock, another great way to use leftover turkey (and bones). Chicken broth would work almost as well as would leftover chicken. The idea behind cooking the mushrooms in this way is to get the pan just hot enough so that the juices exude and evaporate very quickly, rather than pooling in the pan. As the liquid evaporates it leaves lots of flavor behind. Then as the mushrooms begin to caramelize, they will be at the peak of their flavor. Yes, I do use a little butter here; I think it adds richness to the potatoes and a polish to the sauce. I honestly feel there is no harm in using butter as long as it is used in moderation. If you think about it in terms of, two tablespoons of butter in a dish of 10 – 12 servings, it actually works out to very little fat per serving. Just enough in fact that I didn’t miss the whole milk (or cream) that I used to use in mashed potatoes. As the potatoes come together the goal is a fluffy creaminess with still a little stiffness…too much liquid would result in a watery final dish. Start to finish the dish took a little over an hour to prepare…40 minutes prep work and 30 in the oven. This one is definitely good enough for company as the friend that came to dinner simply couldn’t stop eating it. It was, for sure, a great way to use up a little more of that leftover turkey! Place the potatoes into a large saucepan or soup pot and add enough water to cover. Add 2 tablespoons kosher salt and bring to a boil over medium high heat. When the water is boiling reduce the heat to medium and cook until fork tender. Heat a large saute pan over medium high heat. When the pan is nice and hot add the olive oil and swirl in the pan to distribute. Add the mushroom and sage and cook stirring frequently until the liquid has cooked out of the mushrooms and they are showing signs of browning. Then, add the leeks, carrots, and celery to the pan along with several good grinds of pepper, the marjoram, and the thyme. Reduce the heat to medium and cook, stirring often until the celery is tender-crisp. Stir the Turkey into the pan along with 1 Tbsp of butter and cook, stirring, until the butter has melted. Stir in the flour and cook two minutes more stirring gently to incorporate. Stir in the broth being sure to loosen any browned bits that have stuck to the pan. Reduce the heat to low and allow the mixture to simmer and thicken, stirring only occasionally, while you prepare the mashed potatoes. When the potatoes are fork tender carefully pour into a colander or sieve to drain. Allow the potatoes to sit for 5 minutes to allow the steam to dry the potatoes before returning them to the cooking pot. Crush the potatoes slightly then add ¾ of the buttermilk and the yogurt. Mash well with a potato masher (or mixture) until well mashed. Add the butter and the remaining buttermilk and continue mashing until your desired consistency is reached. Taste the potatoes and season with salt if needed. Stir the turkey mixture once more, stirring in the fresh parsley. Taste the mixture to check the seasonings, add salt & pepper if needed, then pour evenly into a 9 X 13 baking dish. Top the turkey mixture evenly with approx. ½” thickness of the mashed potatoes using the back of a spoon to even out the surface. Sprinkle the top with a little paprika then bake 30 minutes. Rest 10 minutes and serve, garnishing each plate with a little more fresh chopped parsley. This entry was posted in Entree, Poultry and tagged buttermilk, carrots, casserole, celery, fresh, leeks, Leftover, mashed, pie, pot, potatoes, recipe, Recipes, shepherds, turkey, yogurt. Bookmark the permalink.